A great American painter and engraver, John William Casilear was born on June 25th,1811, in the city of New York. He was a prominent landscape artist who belonged to the Hudson River School. He got his training under the famous 19th-century engravers like Peter Maverick and Asher Durand. It was in the mid 30s decade that Casilear turned his attention to landscape painting due to the influence of his friend Thomas Cole. In the year 1840, William Casilear accompanied several famed artists on a trip to Europe to sketch vivid landscape scenes and paint picturesque places. They also visited several art galleries and museums to foster their interest in painting. Casilear, as a painter, developed his artistic skill gradually with landscape art painting. This painting style later came to be known as Hudson River School paintings. His paintings and sketches were serene and refined. 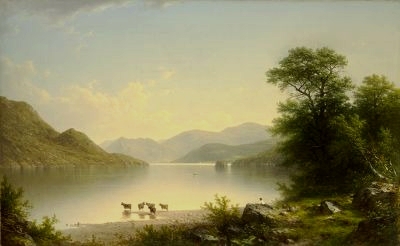 For example, a classic Casilear painting with shoreline view that included many cows in the background leisurely wading in the shallow waters of Lake George, is a typical Hudson River School painting. Such paintings highlight his unusual skill for fine draftsmanship and glowing ambience. Casilear never sacrificed his personal and natural vision throughout his art career. In the last few decades of his life, his view was broad-minded and also accommodated unique new techniques such as Barbizon and impressionism painting styles. William Casilear met with his death in the year 1893, in Saratoga Springs in New York City. He was 82 years of age at the time of his death. William Casilear was considered one of the greatest 19th-century American painter and engraver. His artworks and examples of his fine paintings have been stored at the Metropolitan Museum of Art in New York City, Ringwood Manor in New Jersey, Woodmere Art Museum in Philadelphia, and National Gallery of Art in Washington.